Today, we are writing in hopes of encouraging you to grab the bull by the horns and make a concerted effort to engage each and every customer in the online conversation. Chances are, as a local business owner or marketer, you are getting a number of online consumer reviews. Given the latest statistics, chances are those reviews are either neutral or positive, but let us ask you a question: Are your reviews fresh? When it comes to reviews that make a difference in swaying new customers your way, as well as improving how potential customers find you, recency matters. Having a constant influx of reviews appearing in the main review sites can make a marked difference on the number and quality of leads you are able to secure from these channels. But how can new reviews help you when it comes to boosting your online reputation? When potential customers head to your review profiles in search of additional data to help them decide whether to engage your services or not, having fresh reviews is essential. An outdated review may cause a potential customer to question your ability to deliver high-quality services right here and right now. In addition, an outdated review may raise questions as to why there are no new reviews in association with your business or service. A fresh, positive review says that you are presently engaged in delivering superior and seamless customer experiences. For this reason, highly successful reputation managers are constantly looking for ways that ensure a constant drip of new reviews to all their online profiles, or at least to those most likely to rank first when potential customers are conducting pre-purchase research. Seasons change, menus change, and strategies to engage your customers change. Generating new reviews helps shoppers find stories that are aligned with what you truly have to offer. A fresh, positive review quite often includes references to value, in relationship to price or amenities, and provides potential customers with priceless insights that set the stage for realistic expectations regarding your venue. On the other hand, an outdated review may misguide customers by creating false expectations regarding your offering. Think, for example, about a customer eager to try your outdoor infinity pool, as described by your most recent review, only to find out upon arrival that your pool is closed during the winter. 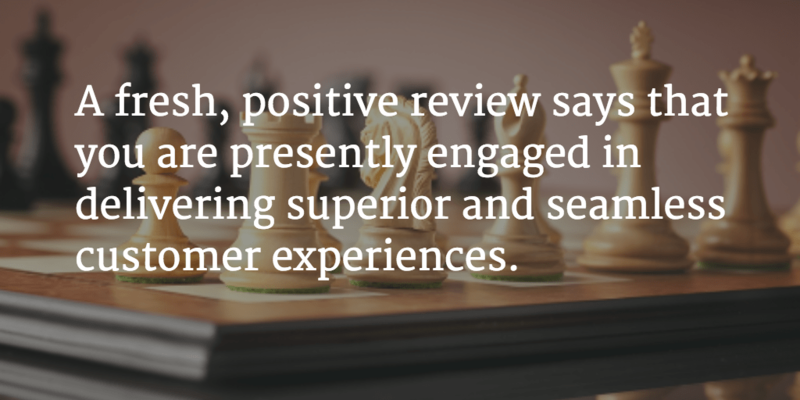 Having fresh reviews is a great reinforcement of the status of your venue. Having a constant influx of fresh reviews on sites such as Yelp, InsiderPages, TripAdvisor, and Google My Business can be a game-changer when it comes to long-tail responsiveness. Your reviewers are constantly creating strings of content that are significantly different from the way you are likely to describe your products and services. Surprisingly, they are often better aligned to the keywords other consumers are likely to use when searching for your business. More reviews means more frequent visits from search engine crawlers, which in turn results in higher prioritization when it comes to your profile ranking on search results. In addition, embedding reviews on your own site with a widget, can help you capture those same benefits on your own site. If you have been proactively managing your online reputation and using feedback to take corrective action and improve service delivery, then fresh reviews are a means of validation to help you track the impact of changes made to products, processes, or services. Without new reviews, it is difficult to know if the revisions you have made have a positive impact on the customer experience. In order to make best use of the business intelligence available on popular review sites, it is essential that you take a holistic approach to review monitoring that captures the data that matters most and provides you with the necessary infrastructure to track relevant trends. Making your review profiles responsive to trending topics can give you a competitive edge in terms of lead generation. Imagine, for a moment, you are a hotel with a prime location to enjoy the Cherry Blossom Festival in Washington, D.C, with a third-party review site profile where your customers speak about the qualities that make you the best fit for the type of traveler heading to Washington, D.C. Customers who enjoy this event can have a significant impact in terms of securing high-quality leads with likelihood to convert. Similarly, if your venue caters to seasonal travelers, then new online reviews can be impactful by providing rich details as to what others can expect from your venue. This is perhaps the greatest and most valuable benefit of having a constant stream of reviews feeding your review profiles. TripAdvisor, for example, takes into account the frequency, density, and scores of customer reviews when creating the coveted popularity ranking. Yelp also uses frequency of reviews when determining which restaurants or venues will be listed on their favorites for each year. For those in the hospitality industry, a highly ranked TripAdvisor profile can represent as much as 40 percent of their total business. To this end, those in the travel and hospitality segment need to do everything in their power to maintain engagement. Thankfully, TripAdvisor empowers businesses by providing practical, implementable ways to increase customer engagement. If your business is listed on TripAdvisor, then take time to become familiar with their integrative widgets, as well as their Review Express platform, which has a proven track record of helping businesses secure high-quality reviews for their profile. You can also use ReviewTrackers’ Feedback and Review Request feature to make the process of requesting customer feedback faster, simpler, and more effective than ever. At ReviewTrackers, we’re committed to helping businesses and marketers succeed, and we believe that the incorporation of practices that lead to increased numbers of high-quality reviews will undoubtedly push your business to the next level. Take a moment to learn how our software platform is already making a difference in businesses just like yours. Some of the nicest people are the ones making huge mistakes that cost them business. But people don’t want to tell them because they’re so nice. Online though; people will say anything. It may not be the most fun to read the reviews sometimes; but they’ll tell you where you could use improvement. You also learn how your employees perform while you’re not around. It can be hard for some people to accept advice. They’re also usually the ones that react poorly to online reviews. It is so important to have positive reviews on many sites but some people forget the importance of these reviews being current. Current reviews reflect how the business is doing in recent times and lets people know you still provide quality service. Older reviews can lead people to wonder what has happened to cause people to stop leaving reviews.